As a marketer, ensuring that the right message is delivered to the right person at the right time can be challenging. Perhaps a company’s buyer personas are mapped out, everyone understands each stage of the buyer’s journey, and all content efforts are streamlined, but does that mean they really know their customer? With a wide range of content nowadays that’s easily accessible through an abundance of channels it’s clear to see how people can get overwhelmed. But, in today’s marketing world, content builds relationships. Relationships are built on trust. Trust drives revenue. Revenue equates to success. What makes a potential customer stop and read one piece of content over another, though? Personalization for marketers is nothing new. For years, brands have been creating content and exclusive deals based on customers’ likes, past purchases, or even their location. The difference now, however, is the technology and utilization of data behind the scenes. To create highly personalized experiences for potential clients, content strategies must be data-driven. Otherwise, all online marketing efforts will leave marketers chasing their tails. Without data, marketers wouldn’t receive any insight into how their content is performing, if it’s resonating with people, or if they need to adjust their strategy. While casting a large net for content may prove lucrative in some circumstances, data and personalization is imperative for getting real return on a company’s marketing efforts. Some companies have even gone so far to create Account Based Marketing (ABM) teams to create hyper-personalized content for specific accounts. 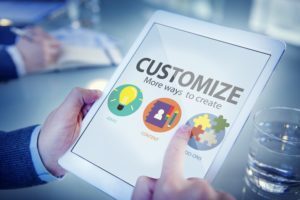 Though that solution may be attainable for some, the need for personalization has left marketers taking a critical eye to their current content efforts and seeking solutions to improve. A recent survey from Demand Metric looked at the reasons why marketers don’t personalize content and found that many don’t have the technology and others don’t have the necessary resources. That same survey, though, found that 80 percent of marketers believe personalized content is more effective than non-personalized content. Personalization isn’t just for marketers. It plays a significant role in healthcare, as well. Precision medicine, or personalized medicine, is the latest innovative approach to tailored medical treatment that considers individual differences in patients’ genes, environments, and lifestyles. The promise of precision medicine is delivering the right treatments, to the right person, at the right time. Such a paradigm shift in care delivery will rely heavily on data leveraged from direct and indirect sources to provide a more holistic view of an individual patient. As generalized treatments can be viewed as casting a large net to patients, personalized medicine will remove the need for guesswork and variable diagnoses. This level of care optimization not only affects patient outcomes and healthcare costs, but it inevitably affects the nation’s bottom line. Just like healthcare, the marketing landscape is changing, and the companies taking a proactive, personalized approach to adjusting to these changes will undoubtedly capture a larger share of the market.